It was September of 2012, the blistering heat of August had finally started to decline and the evenings still had enough light left for me to sneak out on the bike for a short ride before dark. On this particular night I slipped my Canon S90 into my jersey pocket and head out down through the Oak Point Nature Preserve and connecting bike trails – sticking to the trails because my wife was out of town and didn’t want to end up getting hit by a car while riding on the roads. And that plan had worked out well, it was almost dark and I stopped just a few miles from home, at one of my favorite farm land photo locations just as the sun was near the horizon and started taking various landscape and abstract shots. The S90 is a wonderful little camera, and I got a number of interesting shots from the location. This one in particular stands out, the great colors of the sunset split by a single strand of barbed wire. 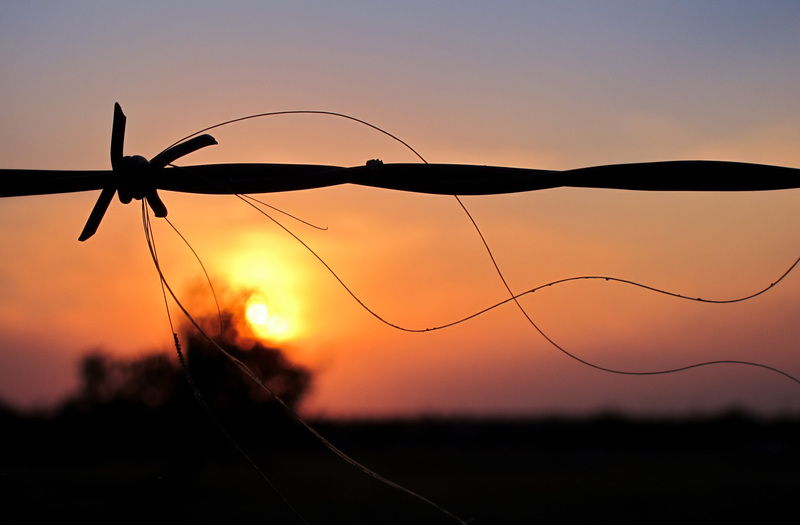 But I believe it is the addition of what ever it is that is caught in the barbed wire, with the graceful curves that balance out the soft out of focus sunset and firm lines of the barbed wire, that makes this photo stand out from the rest.